Heat a heavy-based saucepan over a medium heat and add a splash of oil, the onion, garlic, thyme leaves, finely chopped sage, salt and pepper and sweat down for 5 minutes. In the meantime, peel and dice the pumpkin into small, bitesize pieces, and dice the apple. When the onions have softened, add the diced pumpkin and a little more seasoning, then sweat down until they begin to soften. Turn up the heat and add the risotto rice, frying gently until the grains pop a little before adding the wine. Once the wine has been absorbed, add the stock bit by bit, cooking gently until each measure has been absorbed. After 15-20 minutes, all of the liquid should be absorbed and the rice will be tender. 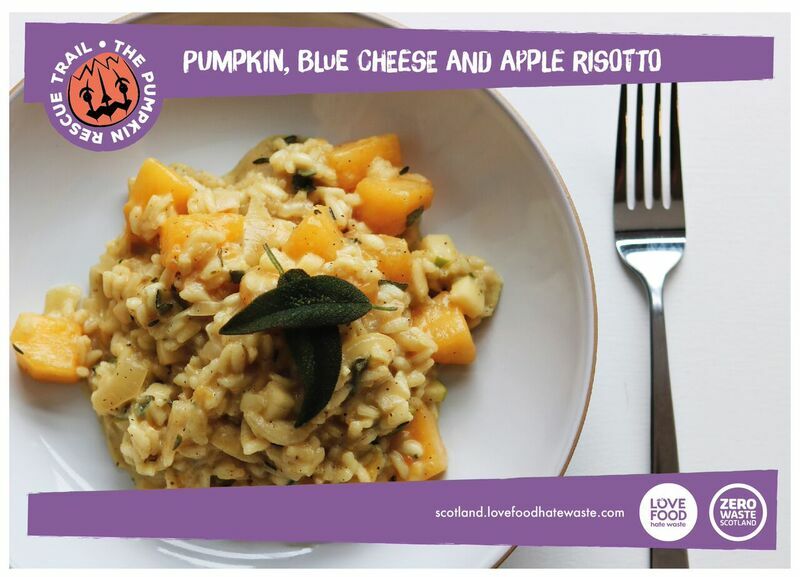 Take the risotto off the heat and beat in the butter and grated parmesan before folding through the diced apple and blue cheese. Season with salt, pepper and a squeeze of lemon juice. Serve with a butter-fried sage leaf and side salad.